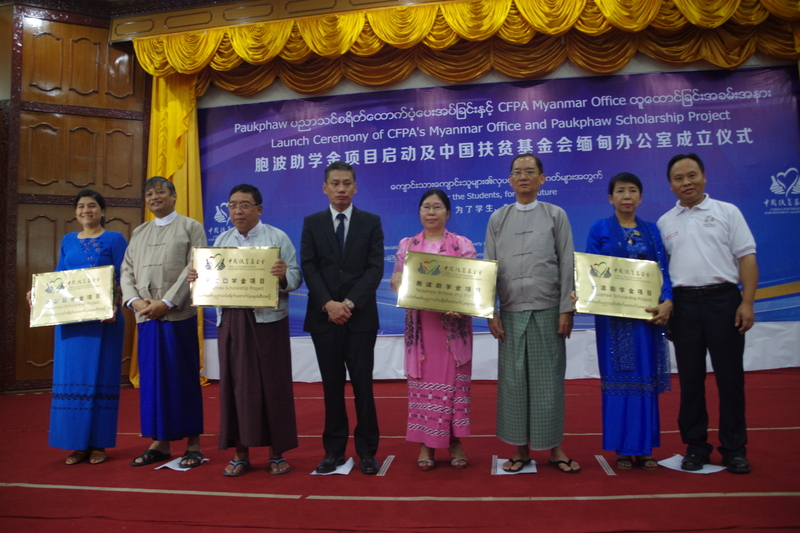 On August 5th 2016, China Foundation for Poverty Alleviation, the Higher Education Department of Myanmar Ministry of Education, the Embassy of the People’s Republic of China in Myanmar and the Center for Strategic and International Study of Myanmar Development and Resources Institute jointly hosted the “Launch Ceremony of CFPA’s Myanmar office and Paukphaw Scholarship Project” in Yangon. The theme for the ceremony was “For the Students, For the Future”. Attendees included: Dr. Thein Win, Director General the Higher Education Department of Myanmar Ministry of Education, Mr. Chen Chen, the Minister Counselor of the Embassy of the People’s Republic of China in Myanmar, Mr. Wang Xingzui, the Executive Vice President of the China Foundation for Poverty Alleviation, Dr. Nay Win Oo, the Vice Director of the Ministry of Education Department of Higher Education in Lower Myanmar. and Ms. Sandar, Representative from Center for Strategic and International Study of Myanmar Development and Resources Institute; Headmasters and students from Yangon University, Yangon Foreign Language University, Yangon University of Economics, Yangon University, East Yangon University, West Yangon University, Yangon Normal University and Dagon University. In his speech, Dr. Thein Win, Director General the Higher Education Department of Myanmar Ministry of Education expressed enthusiastic support for the community based “people helping people” model of the “Paukphaw Scholarship Project. He welcomed the launch of the project and expressed thanks on behalf of the scholarship recipients, whom he urged to study diligently in order to contribute to society and further the traditionally close ties between the peoples of China and Myanmar. China in Myanmar Mr. Chen Chen also expressed support for international humanitarian work by Chinese NGOs. He hopes that in the future more Chinese NGOs will establish offices in Myanmar to undertake humanitarian work in response to the increasing goodwill of the Chinese people. Representative from Center for Strategic and International Study of Myanmar Development and Resources Institute Ms. Sandar introduced additional information background of how the Paukphaw Scholarship project was introduced in Myanmar. In his speech, Executive Vice President of the China Foundation for Poverty Alleviation Mr. Wang Xingzui noted the longstanding historical friendship between the peoples of Myanmar and China. He hopes that the “Paukphaw Scholarship Project” will strengthen ties between the peoples of Myanmar and China in addition to it’s primary objective of enabling financially struggling students to complete university. He also expressed CFPA’s willingness to undertake future humanitarian work through the foundation’s Myanmar office, in the fields of education, health, community development, disaster relief, and corporate social responsibility advocacy while strictly adhering to CFPA’s 4 internationalization principles of respecting local traditional culture, being needs orientated, sustainable and seeking partner support. 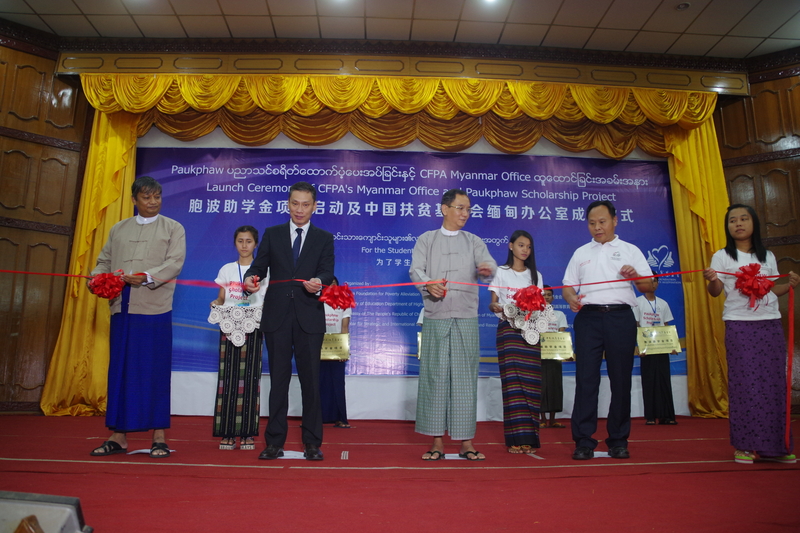 The successful Launch Ceremony of CFPA’s Myanmar office and Paukphaw Scholarship Project heralds a period intense work. 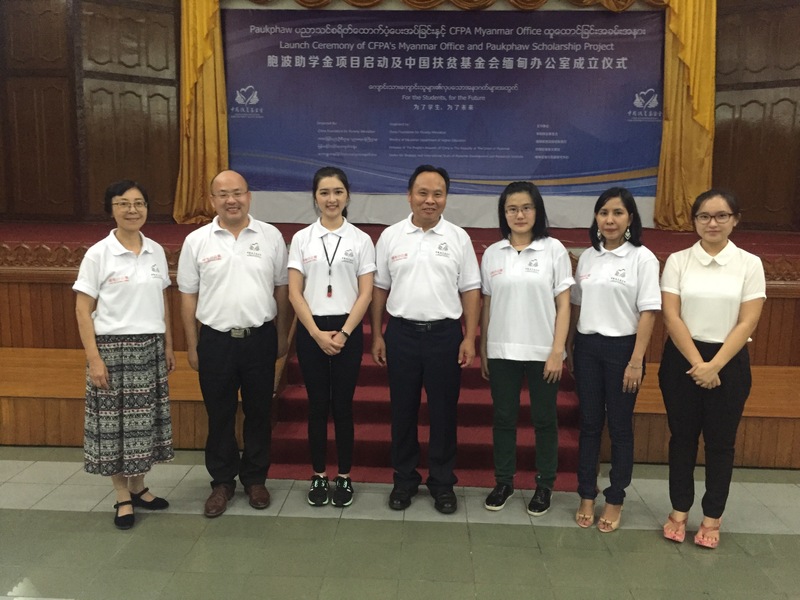 For the next 4 years, CFPA’s Myanmar office will provide 4 years of scholarship aid to 600 university students from poor economic backgrounds at the Yangon University of Economics, East Yangon University, West Yangon University and Dagon University. In 2015 CFPA was formally registered with Myanmar Ministry of Home Affairs to operate within Myanmar as an INGO. Since the aid to Indonesia tsunami in 2005, CFPA practiced in both international humanitarian aid and development.During the past decade CFPA raised 100 million RMB for projects in 15 countries and regions. In 2015, CFPA launched long-term projects in 5 countries, namely Myanmar, Nepal, Cambodia Ethiopia and Sudan. And CFPA officially registered country office in Myanmar and Nepal, symbolizing that CFPA has officially become an INGO. Prev： Second Briefing on Flood Relieve Actions in Southern China by Apple Inc.